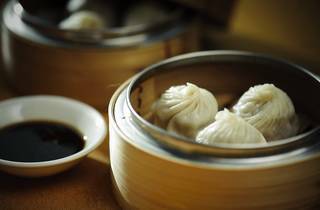 Crystal Jade’s empire is built on a winning trifecta of reliable Shanghainese food, reasonable prices and efficient service. The litmus test? 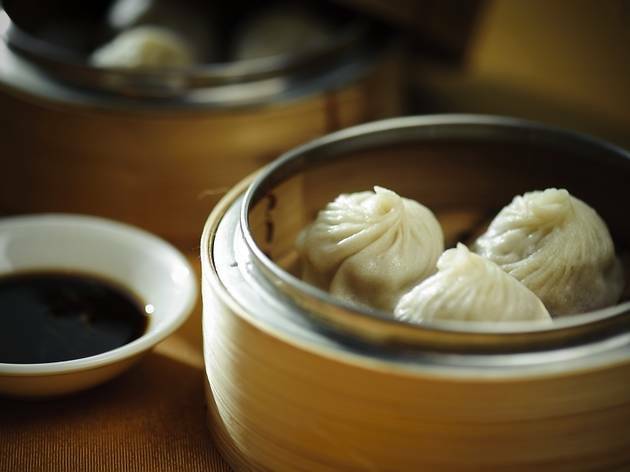 Walk into any of the Singapore-based restaurant chain’s outlets and the famous xiao long bao dumplings will always be the same, thin-skinned, broth-filled packets of porky goodness. You can’t fault this consistency but a breath of fresh air is always appreciated – and this is where Sky Crystal steps into the picture. Housed on the 101st floor of the towering ICC building, the elegant, chandelier-adorned space is the group’s first foray into upper crust dining in Hong Kong. The view is fantastic of course and, thankfully, so is the food and service. From the extensive list of appetisers, try the plum pickled fresh Chinese yam ($78), which is clean and crisp with a slight piquant tinge. It’s a refreshing starter, making it a great prelude to bolder offerings like the house-smoked wine flavoured eggs ($32 each). The yolky centres aren’t quite as molten as the usual Shanghainese tea-smoked eggs and the heady alcohol aromas can seem like overkill at first but buckle down and you’ll be duly rewarded – the taste is much milder than the smell and the flavours soften out and leave behind a lingering sweetness on the palate. The drunken chicken ($98) is another dish worth trying, made with aged huadiao wine to draw out the bird’s umaminess. For hot apps, the chefs whip up crispy rice crackers ($178) and serve them with either fresh tomato sauce or spicy and sour seafood soup. Order the latter and you’ll get a full-bodied broth that won’t exactly set your head on fire but still carries enough tingling heat to perk up the whole affair. Ladle this over the rice and the result is a satisfyingly soupy concoction studded with crunchy little bits. Our only complaint is that they only offer four rice crackers to an order, which is hardly enough to sop up all the delicious sauce. While starters are on the expensive side, you’ll be pleasantly surprised when you see how reasonable the rest of the menu is. Sure, there’s the selection of pricier dishes designed to impress business clients (think $548 for sautéed prawns with egg whites), but simpler offerings like salted pork soup ($88) are just as comforting, a nourishing broth decorated with dried bean curd and bamboo shoots. The red-braised pork belly ($168) is stick-to-your-ribs fare with fat-strewn meat resting on soy sauce-soaked dried bean curd knots. Also go for Shanghainese rice cakes stir-fried in soybean paste ($148). The chewy cakes are carefully diced, giving each piece more surface area to be smothered in the gravy-like sauce. If you can’t stomach the carb-laden eight treasure glutinous rice ($98) for dessert, go for the sticky red date puddings ($45), which are infused with the fruit’s natural sweetness. Shop B2, 101/F, International Commerce Ctr, 1 Austin Rd, West Kowloon, 2673 3839. Daily 11.30am-3pm & 6pm-11pm.